Automatic inlet valves and cam-actuated inlet valves were mentioned earlier. One interesting twist, which had a short production run in the teens, was brought to us via Marvel and Curtiss Motorcycles. The example shown in the images was built by Wes Allen. 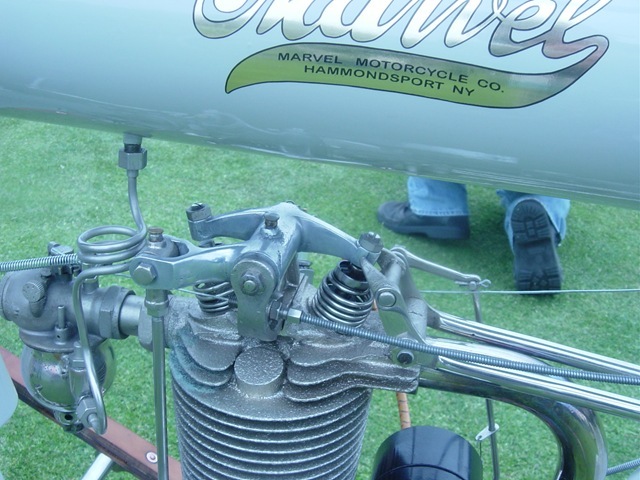 (while he didn’t build 100% of the bike shown, he built most of it, including the frame, forks, tanks, carb, head, barrel, belt rim, handlebars, exhaust and the rear stand. He’ll be featured in a later post, note that he did the castings, plating, metal fab and welding, machining and painting in his home workshop). Did you spot that the tanks are welded into the frame? Oh yeah, the valves…. A pushrod is used to push open the inlet and exhaust valves. Not one pushrod for each, but one pushrod to actuate both valves! The second pic shows the pushrod fitting into a clevis on the rear of the rocker on top of the head. The rocker then splits with an arm each for the inlet and the exhaust valves. We really need to call it a push/pull rod, not a pushrod, since it pulls downward to open the inlet valve. All of which works fine mechanically, until you realize that whenever the inlet is open, the exhaust must be closed, and when the exhaust opens, the inlet closes. If the reader is not familiar with early cam timings they may be alarmed, as this setup does not allow for any valve timing overlap. But early valve timing didn’t use overlap, and didn’t need it with such slow rpms and 4:1 compression ratios. When Wes started the motor, the rocker just oscillated gently, popping the poppet valves open and closed as required. If you look closely, you’ll see another linkage to the exhaust valve on the front of the head. This is just the manual valve lifter used by the pilot during motor starting and stopping. 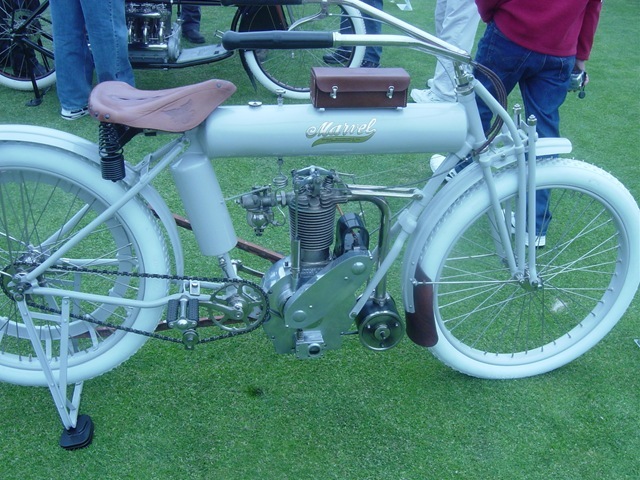 Wes mentioned that this bike in the photos was an original bike that he restored. From scratch, he also made another bike that was a copy of it (other than the motor castings and the major lugs of the frame).